Saturday morning we and three others from our tour were up early and set off with a guide on a three hour drive to Plitvice, the site of a national park that ranks as one of, if not the, top attractions to visit in Croatia. The park was created to protect a naturally occurring set of 16 lakes with thousands of waterfalls. 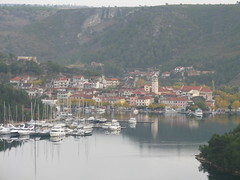 Along the way we stopped to look at the Krka river and the pretty town of Skradin. We then continued onwards before stopping off at what was essentially a truck stop where we had some local 'donuts' and saw both some mounted examples of local wildlife and some live ones as well. There we bears, deer, wild boar and sheep. When we made it to the park we encountered some depressingly foggy conditions. While we were somewhat dismayed we forged further ahead to see the upper lakes and falls which were amazing. Luckily for us by this time the fog was beginning to lift and we were able to clearly see everything we had come to see. The falls are created and change over time due to the formation of travertine. The travertine occurs with the deposit of calcium carbonate borne and harvested by the water from the underlying limestone rock. The water deposits the calcium carbonate on moss, plants and debris from trees and forms rock that then further diverts the water; really quite remarkable. We continued via an electric boat to the lower lakes. There we saw numerous fish in the water as well as more lakes and falls. All were quite beautiful and breath taking. Our journey culminated in seeing the 78m high falls from the Plitvica river. 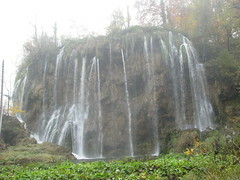 After seeing this waterfall, which we had heard but not seen during our entrance to the park in the foggy morning, we climbed up and out to go for dinner at Licka Kuca, a restaurant that cooks traditional dishes for the “alpine” region of Croatia. Meg had some good homemade sausage while I ate some awesome cheese stuffed pljeskavica. Pljeskvica is much like a mixed ground meat patty with the toppings stuffed inside. While the drive home was long, it offered up some remarkable scenery both before and after the sun set. We were quite exhausted and had only one more day in Croatia to look forward to as we headed to bed. Saturday morning we awoke and ate some breakfast before heading out to enjoy our last day in both Split and Croatia. We walked down to the city center and strolled over to visit both the fish market and the green market. We didn’t see anything too out of the ordinary at either, but both had fresh offerings for sale. Leaving the markets we chose to visit the Split Ethnographic museum that houses a somewhat small collection of primarily ethnic outfits, costumes and accoutrements. It was fairly well done and not overly expensive for entry so certainly worth a visit. Next up was a visit to the basements of the palace. 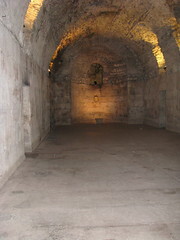 This was quite something to see, as the basements are the best-preserved area of the old palace. 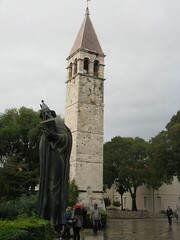 When the Croatians moved into the palace for protection they only used the basements as a landfill and as a result they are largely the way they were originally constructed. They are really a testament to the level of engineering at that point with large chambers and vaulted ceilings all over the place. For lunch we decided to eat along the Riva, the city’s number one place to be seen. It was a beautiful day out and so the place was fairly well packed. We enjoyed a slightly Italian meal and a chance to relax a bit and watch people stroll up and down. There were at least two large cruise ships in town so there were plenty of people out and about. Not content with having visited two museums we made our way up to the Split Archaeological museum to see their collection as well. Outdoors they had an assortment of funerary stones, columns and other ancient stonework. Inside they had another collection of typical archaeological findings including coins, pots, containers, personal items, weapons and the like. It is certainly remarkable to see the dates on these sorts of things. 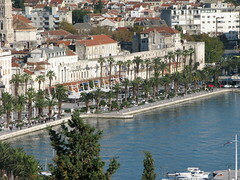 To finish off our sightseeing we chose to visit the main urban park in Split, the Marjan. The park comprises a pine-forested hill on a peninsula just west of the city centre. It’s a fairly large park, with a maximum elevation at roughly 180m. We walked up the stairs that start just past the end of the Riva and then hiked around on the trails within for a while. We watched a couple of cruise ships leave the city from a bench overlooking the bay between Split and the islands before heading back down. Before descending the stairs and finding some dinner we chose to have beer at a small bar overlooking the city. For dinner we ate at the extremely sensibly priced Fife, another konoba, actually meeting up with one of tour mates. Then, with dinner over and our stay drawing to a close we made our way back to the hotel, picking up some chocolate along the way in an effort to reduce our Kuna holdings. The next morning we were up at 4am and off on our journey back to Canada. Croatia was lovely, and somewhere we would definitely return. It should be interesting to see how the country changes should they ever enter the EU.